Building on our work to develop the concept of World Heritage Education, in honor of Philadelphia's new status as a World Heritage City, SAC developed this teacher training program with the Global Exploration for Educators Organization (GEEO) and several other collaborators. The 18-day trip contrasted the colorful culture of India’s cities with the peacefulness of Nepal's majestic mountains. From the banks of the Ganges in Varanasi, India to a jungle safari in Chitwan, Nepal this teacher training took educators through diverse ecological and cultural landscapes in the subcontinent before concluding in Kathmandu’s Durbar Square. In India, the group visited World Heritage cities like Agra and Amer, and World Heritage sites such as the Taj Mahal, Agra Fort, Jantar Mantar, and Jama Masjid Mosque. Teachers navigated the congested Nepalese World Heritage city of Kathmandu, walked through the maze of Buddhas in Lumbini (which some consider the birthplace of Siddartha Gautama, the Buddha), and enjoyed watching birds and wildlife in Chitwan National Park. The itinerary maximized learning through personal exploration, guided tours and lectures on the subjects of history, culture, education and the environment. Accompanied by SAC’s Associate Director Rachelle Faroul, Senior Master Teacher Fellow Dr. Sarah Sharp, the G Adventures guide Manu Rao and expert on South Asian architecture and history Dr. Pushkar Sohoni, teachers were able to dig deeply into the significance of these historical landmarks and were guided through thoughtful comprehension of content areas. 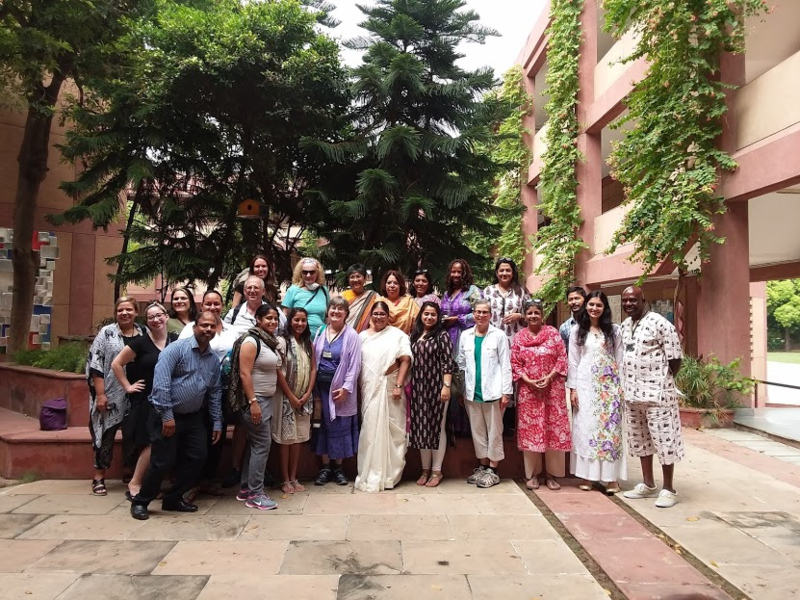 Teachers were encouraged to contemplate the value of intercultural encounters with their interactive meeting with two local schools in Delhi, the Sri Ram School and Vasant Valley School. They were thrilled at the opportunity to visit local classrooms and network with colleagues across borders. Some teachers even made connections to start a pen pal program to foster cross cultural connection among their students.